The Daily GRRR! HEADLINES for Dec. 16, 2014. 1. 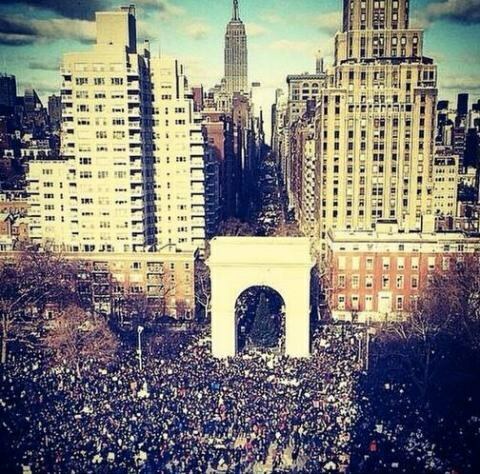 Tens of thousands march against police brutality in major US cities. 2. Arctic oil exploration threatens narwhals and Inuit way of life. 3. Indigenous land defender finally free but in need of legal funds. 4. Indigenous warrior raises funds to grow more food for the movement. 5. Monsanto sues Vermont over proposed law to label GMO foods. 6. Racial profiling to blame for too many black children in foster care. 7. Black man sues Toronto bank for arrest while making legal deposit. Welcome back to SoundFM! You are now listening to The Daily GRRR! heard on the airwaves at 100.3fm, CKMS in Waterloo, Ontario, and SoundFM.ca on the web. This is Kathryn and I’ll be your host on this Tuesday morning show for December 16, 2014. As reported by The Guardian, thousands of Americans took to the streets on Saturday in Washington, New York, and several other cities to protest recent grand jury decisions regarding the deaths of black men at the hands of white police officers. The grand jury decisions in Missouri, regarding the death of Michael Brown, and New York, regarding the death of Eric Garner, both ruled to not indict the trigger-happy cops who killed these men. They have unleashed a torrent of demonstrations across the country and hurled long-simmering tensions over racial injustice and police brutality into the national spotlight. More than 20 people were arrested in Boston on Saturday, as hundreds gathered around the Massachusetts state capitol amid a heavy police presence. Largely peaceful protests took place in Chicago and Oakland, while in New York City, thousands marched from Washington Square Park uptown, via 6th Avenue, before turning downtown to progress along Broadway and on to NYPD headquarters at One Police Plaza. Later, after darkness had fallen, protesters attempted to stop traffic on the Brooklyn Bridge. Throughout the New York march, demonstrators chanted: “Eric Garner, Michael Brown. Shut it down. Shut it down.” To the east, in Washington, throngs of protesters wound their way down Pennsylvania Avenue to the Capitol on a chilly December day. Among them were around 400 protesters who came by bus from Ferguson, the site of Brown’s death in August and sizeable protests since. The demonstrations were dubbed a “day of resistance”, against what protesters are quite accurately decrying as rampant police brutality against people of color, especially young black men. As reported by SumOfUs.org, off the coast of Clyde River, Nunavut, unspoiled Arctic waters are home to 90% of the world's narwhals. These unique tusked whales play a crucial role in the aquatic ecosystem, and for thousands of years have been a staple of the local Inuit community. But now their very survival is in danger. The Canadian government and the National Energy Board have granted oil corporations the right to search for drilling sites in the ocean near Clyde River. Offshore drilling is bad enough, but the search is worse – these oil companies will use "seismic testing," setting off huge explosions underwater to try and find oil. Like all whales, narwhals use their hearing to communicate and to find their way safely beneath the Arctic ice. The search for oil will deafen, disorient, and kill any narwhals caught in its path. The narwhals play a crucial role in the Arctic aquatic ecosystem. They are also an important food source for the native Inuit people, many of whom rely on subsistence hunting to survive. For generations, big corporations have stripped northern Canada of its natural resources, trampling the rights of native peoples and destroying entire ecosystems for profit. The government has been complicit in this, auctioning off oil and mineral rights to the highest bidder and ignoring the consequences. But until now, the narwhals and the local ecosystem they support have managed to survive. Now, that local environment and the Inuit livelihood are both being put in dire jeopardy. Christopher Thunder was arrested on August 20, 2014, while he was waiting for a ride to Hamilton, so he could catch the bus to the People's Social Forum where he was invited to participate in the People of Colour and Native Youth delegation. Chris was arrested for an alleged breach of legal conditions because at that moment it is alleged that he was not with his sureties. Chris has remained in jail since this unlucky event, where he was clearly targeted by the OPP. The conditions that got him in jail were set because Chris had allegedly missed a court date while on a healing journey across Canada. This journey began when Chris joined fellow Onkwehonwe from Saskatchewan in a walk to Ottawa, entitled "Journey for Earth", to raise awareness of a wide range of government bills, the illegal international trade deal with China, known as FIPA, and to spread awareness about the environmental dangers of uranium mining and processing. Returning to Saskatchewan with the walkers, Chris then joined the Tar Sands Healing Walk, a National Treaty Gathering and Pow Wow, an Honour the Apology Gathering, and ultimately the Unist'ot'en camp, where Chris helped the Unist'ot'en build a traditional pit house on the proposed route of the Pacific Trails Pipeline. Following this journey, Chris joined a number of women warriors he met during the healing walk to travel to New Brunswick and the Mi'kmaq territory of Elsipogtog, where they joined the camp set up to stop fracking from being imposed on their land. This recent history demonstrates how direct action is very important to Chris, and also likely the reason that he has been targeted. He is not trying to run away from his legal responsibility to go to court, but is rather embracing his responsibility as a Haudenesaunee to protect the land. Although Chris is now out of jail, he and his supporters have yet to cover the cost of his impending trial, which is expected to range from $3,000 to $5,000 depending on how long it lasts. According to their GoFundMe page, so far they’ve just barely reached the lower end of that range, with the fundraising total now at $3,145 out of their $5,000 goal. And that’s from just 75 donors! They are still in need of any contributions that folks can make, big or small, so we’ve linked to their donation site here on the podcast page for today’s show. Meet Wolverine. He is 84 years old, and lives in C'yele near Chase, BC, as part of the Secwepemc Nation. Each morning, Wolverine gets up, and tends to a garden full of beans, squash, corn, tomato, carrots and potatoes, all traditionally grown without the use of GMOs or pesticides. But this isn't just any garden. And this isn't your average 84 year old. It’s called "Nourish the Nation", an autonomous Indigenous garden project, and Wolverine tends to a whopping 8 acres of land. What’s more, he gives away almost the entirety of his harvest to elders in autonomous communities, single families, and to courageous camps of individuals defending their traditional territories against the onslaught of devastating extraction projects. What makes this even more incredible? Wolverine attends to this insurmountable revolutionary project all by himself. Every single dollar that you donate will go towards the purchase of a small tractor, an irrigation upgrade, and fencing- all to keep this project alive. In an effort to raise more contributions, a “Wage Solidarity” day was organized earlier this month. On December 4th, hundreds of people across Turtle Island were invited to donate their day's wage in labour. The idea was inspired by Queen Sacheen of Ancestral Pride as a way to build active allyship by contributing monetary funds to autonomous Indigenous nationhood independence movements. According to the petition and fundraising site SumOfUs.org, “The world's most hated corporation just got even more evil.” Vermont is set to make history by becoming the first state in the country to require genetically modified (GMO) food to be labeled. But Monsanto, the world’s largest GMO producer, is gearing up to sue the state. Monsanto and its allies have launched a lawsuit against the tiny, rural U.S. state of Vermont to stop the new law, which would put no limitations on these companies other than requiring that their genetically engineered foods be labeled for consumers’ awareness. In fact, the mere threat of a multi-million dollar lawsuit nearly caused the state to back off the labeling law altogether. But Vermont is now refusing to back down, and they’re asking for the public’s help. They're getting ready to fight back against Monsanto, and have even created a legal defense fund so people around the world can make donations to help them beat back Monsanto’s lawsuit. But the trial is about to start, and the legal defense fund is still short, so the state is seeking donations of $1 or more to help cover the cost. Already, more than 28,000 people have chipped in through the petition site, so Vermont looks to be well on their way to covering those legal fees and we look forward to coverage of the trial as the case is made to set a precedent for finally labelling GMO food so that more people can know what they’re really eating. As reported by The Toronto Star, a disproportionate number of Toronto-area children in foster and group-home care are black, for which advocates are blaming poverty, cultural misunderstanding, and racism. Within the GTA, black children are being taken from their families and placed into foster and group-home care at much higher rates than white children. Numbers obtained by the Star indicate that 41 per cent of the children and youth in the care of the Children’s Aid Society of Toronto are black. Yet only 8.2 per cent of Toronto’s population under the age of 18 is black. By contrast, 37 per cent of kids in the care of the Toronto CAS are white, at a time when more than half of the city’s population under the age of 18 is white. But it’s not just Ontario’s capital, either; other figures obtained by the Star indicate that the overrepresentation is provincewide. “The gross overrepresentation of black kids in the CAS is like a modern-day residential schools system,” says Margaret Parsons, executive director of the African Canadian Legal Clinic, which advocates on behalf of the province’s 590,000 black residents. “This is another form of racial profiling,” she says. “They’re profiling black parents in a very negative way.” Lawyers, black community leaders and child advocates say the overrepresentation of black children is due to cultural misunderstandings and stress and neglect created by poverty. They also believe systemic racism is at play within the child protection system, as well as the police departments and even schools. “We received a call because a child was sent to school with roti,” says Danielle Mitchell, a child protection worker at Peel CAS. The teacher believed the popular Caribbean flatbread, usually filled with goat or chicken curry, was “not healthy or sustainable for this child,” Mitchell says, adding that “that’s the school system …” and seemingly lamenting the shameful reality of cross-cultural ignorance and outright racism. Corrie Tuyl, the CAS manager of Toronto’s north branch, says workers have told her about a school that called with a referral simply because a child was from Jamaica. Frantz St. Fleur has filed a $225,000 lawsuit alleging racial profiling after a routine trip to the bank led to him being arrested on suspicion of passing a fraudulent cheque, according to a statement of claim filed with the court. The 38-year-old man, who has banked with the establishment for almost a decade and has several accounts there, was trying to deposit a refunded $9,000 real estate deposit in April after a condo purchase fell through. After he presented the cheque for deposit, a bank employee escorted him to her office and offered him investment opportunities, according to the statement of claim. “I told her I was going to work,” he said. “She offered me business. She wanted to invest that money for me. I said it’s a good idea to invest the money but I don’t have time — just deposit it for now.” St. Fleur said the teller left and, soon after, police appeared to arrest him. Taken to the nearby police station, he was questioned and released once police determined the cheque was valid, according to the statement of claim.